Headlong was written by Michael Frayn. 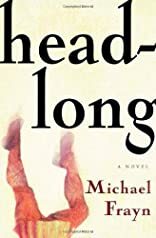 Headlong was published by Picador USA. Subjects of Headlong include Fiction, Fiction - General, and General. About Michael Frayn (Author) : Michael Frayn is a published author. Some of the published credits of Michael Frayn include Headlong (Unabridged), Spies (York Notes Advanced), Cherry Orchard: A Comedy in Four Acts (#2989).